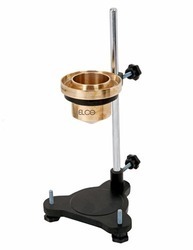 Low Cost Flow Cup Viscometer made of Brass with SS orifice Supplied complete with stand equipped with level adjustment system, & Operation manual. Prices are variable, it will be differ according to order & specifications. Flow cup viscometer as per IS 3944 - 1965 complete with stand and leveling screws for adjustment. Available in following sizes Jet No. B-1, B-2, B-3, B-4, B-5 & B-6 Spare brass cup with any size Jet. This type of cup has been in popular use for many years and confirms to IS 3944-1965 specifications. These are available in following sizes. Jet No. B-1, B-2, B-3, B-4, B-5 & B-6. Advanced Technocracy Inc. is Manufacturer, Exporter & Supplier of Flow Cup Viscometers. - Place the Flow Cup on the stand in a place free from draughts, preferably with the air temperature within the range 25 + 5ºC but for referee purposes the air temperature shall be 25 + 1ºC. We are involved in manufacturing and exporting Flow Cup Viscometer(Ford Cup). These apparatus are used to ascertain the viscosity levels of fluids like water, grease, oil and others. Made of high grade metals, these apparatus are appreciated for sturdy designs, accurate readings and corrosion resistant finish. It is generally known as Ford cup. This cup is made of gun metal designed according to the specific dimensions and shape prescribed in standard specification. 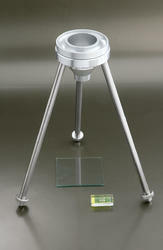 This is used to measure the viscosity of liquid i.e. paint, ink, varnish, etc. Generally B-4 cup is used, but we can offer B-8 or B-10. This type of cup has been in popular use for many years and confirms to IS 3944-1965 specifications. These are available in following sizes. Jet No. B-1, B-2, B-3, B-4, B-5 & B-6. Made of gunmetal and the orifice is made from stainless steel. A protective skirt is provided at the bottom of the cup to minimize the risk of damage to the orifice.